No additional discounts apply. 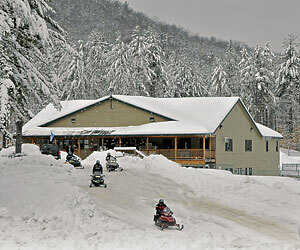 Deluxe cottage and cabin rates are subject to 9% NH Rooms and Meals Tax. excluding 10/7/18 and 5/26/19. Want to commend the manager Diane and the security people who helped us in a difficult situation. Would recommend this place because of these nice people. Awesome place, my wife and I love coming here, and hope to come every year for our weeks vacation. We are thinking of staying two - three weeks, the location is wonderful. Wonderful friendly helpful staff. Very clean grounds,bathrooms and very helpful when you have issue with setting up .The lake is beautiful and plenty to do. Bathrooms very clean. Located between the Lakes Region and White Mountains of New Hampshire, family-friendly Danforth Bay Camping & RV Resort offers over 300 tent, RV and extended-stay campsites, many nestled along the shores of Danforth Bay of Ossipee Lake. Spread on over 185 forested acres, the four-season resort features rolling hills, expansive beaches, secluded knolls and meandering brooks. 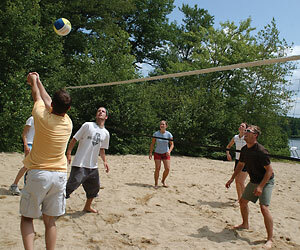 Pet-friendly Danforth Bay offers clean, modern facilities, two heated swimming pools, a kiddie pool, two sandy beaches, numerous court games, an extensive recreation program, free WiFi, plus unique theme weeks and weekends. 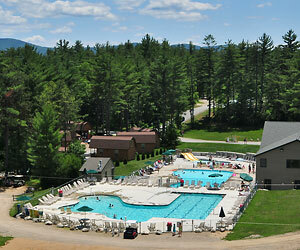 The resort is truly big-rig friendly, with wide roads and spacious wooded campsites. 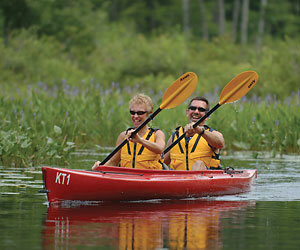 In fact, Danforth Bay has more than 100 campsites that can accommodate even the largest of recreational vehicles. Among those sites are 24 pull-through sites with easy-in, easy-out convenience, 20/30/50 amp service, and new deluxe, duel-septic sites with level, 45'x12' concrete pads. In addition to roomy sites, Danforth Bay also has smaller, more intimate sites situated along a winding brook - perfect for tents and pop-ups. Many campsites are along the half-mile shoreline, or atop rolling hills overlooking Danforth Bay of Ossipee Lake. 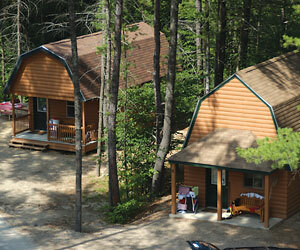 Danforth also offers guests the opportunity to stay in and one of ten camping cabins. Three rustic cabins sit on the shore of Danforth Bay and seven deluxe four-season cabins are conveniently located near the pools and facilities.